Bioremediation is the process by which contaminants in soil and/or groundwater are treated biologically, primarily by microorganisms or biomolecules generated by the cells. Bioremediation processes can take place under oxic (with oxygen) or anoxic (without oxygen) conditions. This article focuses on enhanced in situ bioremediation (EISB) for the anaerobic biodegradation of organic contaminants, particularly chlorinated solvents, in soil and groundwater. However, much of the information provided is applicable to other contaminant types. EISB is frequently selected as a remedial technology as it can provide complete degradation of contaminants utilizing natural microbial processes, is able to be implemented in a variety of site conditions, and is relatively low cost compared to more active engineered remedial systems. CONTRIBUTOR(S): Michaye McMaster, M.Sc. and Leah MacKinnon, M.A.Sc., P. Eng. Laboratory and field applications over the past two decades have shown that microorganisms in subsurface environments can degrade a wide variety of chemicals to environmentally acceptable end products. Anaerobic bioremediation of contaminated groundwater and geologic materials typically involves in-situ treatment via biostimulation using various carbon-based amendments, because most sites lack sufficient organic carbon to promote anaerobic microbial respiration. In some cases, bioaugmentation, the injection of a microbial culture, may be required to provide the appropriate microbial community to promote complete degradation of the target contaminants. Anaerobic bioremediation remedies typically involve an initial amendment application, followed by a period of monitoring to demonstrate the remedial goals have been achieved and to evaluate the need for additional amendment applications. Under anaerobic conditions, organic contaminants can serve as the electron acceptors or electron donors during biodegradation processes; we refer to the former as “anaerobic reductive bioremediation” and the latter as “anaerobic oxidative bioremediation”. Anaerobic reductive bioremediation relies on the presence of biologically available organic carbon, which may be naturally present or added to stimulate biological activity. Organic bioremediation amendments, referred to as organic substrates or electron donors, generate and sustain anoxic conditions by consuming oxygen via aerobic respiration, as well as other electron acceptors, during its biodegradation. For example, chlorinated solvents such as trichloroethene (TCE) serve as electron acceptors and undergo reductive dechlorination under anaerobic conditions in the presence of an electron donor. This microbial-mediated process can result in the complete degradation of many specific chlorinated solvents to innocuous end products. Anaerobic oxidative bioremediation relies on other electron acceptors such as nitrate or sulfate for direct microbial metabolic oxidation of a contaminant serving as the electron donor. This approach may be applied for the treatment of non-chlorinated hydrocarbon compounds where oxygen has already been depleted. In contrast, cometabolism occurs when microorganisms do not utilize the organic contaminant as an energy source, but the contaminant is fortuitously degraded by enzymes or co-factors produced during the metabolism of another compound. Many contaminants can be degraded by bioremediation in both laboratory and field settings including the use of biological treatment processes for common organic contaminants as well as metals, metalloids, and perchlorate (Tables 1, 2). Table 1. Biodegradation processes for perchlorate and common organic contaminants. Notes: = Well documented, process is confirmed to occur; = Some amount of documentation; = Only select compounds may undergo these processes; Not routinely documented. Table 2. Microbial-based immobilization mechanisms for common metals and metalloids in groundwater. Notes: = Well documented immobilization mechanism; = Not a documented immobilization mechanism; NA = Not applicable. a - Found in soil and groundwater, bold indicates oxidation states of dissolved/mobile species. b - In-situ precipitation and co-precipitation as sulfides mediated by sulfate reducing bacteria. c - Microbial oxidation of As(III) to As(V) followed by enhanced adsorption of As(V) onto iron and manganese oxides/hydroxides. d - Microbial reduction of Cr(VI) to less mobile Cr(III), followed by mineral precipitation and co-precipitation with Fe as oxide or oxyhydroxides. e - Microbial reduction, followed by precipitation and/or adsorption onto mineral phases. f - Microbial oxidation to Fe3+ or Mn4+ followed by precipitation as oxides/hydroxides. Bioremediation is widely applied for remediation of recalcitrant compounds present in soil and/or groundwater, and is often chosen as it can be a less expensive, adaptable to site-specific conditions, and more sustainable choice to achieve remedial goals. Multiple guidance documents are available that describe design and implementation considerations, and results from applications around the globe. This includes guidance from the United States Environmental Protection Agency (USEPA), the United States Air Force, Navy and Environmental Security Technology Certification Program (ESTCP), and the Interstate Technology and Regulatory Council (ITRC). Contaminant Treatability. Consider whether the target contaminants, as well as any potential co-contaminants, can be effectively treated or immobilized (in the case of metals and metalloids) by anaerobic bioremediation. Remediation of Source Zones. Anaerobic bioremediation has been shown a viable remedial approach for dissolved contaminant mass, and for limiting mass flux from source zones containing dense non-aqueous phase liquid (DNAPL). Treatment of DNAPL mass in source zones has also been demonstrated, but the remedial timeframe is typically longer than applications were aqueous phase concentrations are targeted. Site Conditions. Low permeability and/or high heterogeneity of the targeted formation may limit amendment distribution or influence remedy design. This limitation is common to all in-situ remediation approaches and can be addressed by selection of an appropriate installation method. Incomplete biodegradation. Creation and/or accumulation of breakdown products (e.g., cis-1,2-dichloroethene and vinyl chloride from tetrachloroethene [PCE] and TCE) may occur. In many cases, the design of an EISB remedy can address these concerns by incorporating monitoring to confirm the effects are temporary and introducing additional amendments (pH buffers, bioaugmentation cultures) to prevent accumulation of breakdown products. Potential Process Inhibition. Geochemical conditions (e.g., high/low pH levels) and intrinsic toxicity due to presence of elevated concentration of inhibitors such as metals, chloroform, other organic co-contaminants (e.g., 1,1,1,-trichloroethane) or sulfide should be evaluated and potential mitigation approaches considered. Secondary Effects on Water Quality. Changes in pH and redox conditions in an anaerobic bioremediation zone may mobilize metals (e.g., iron, manganese, and arsenic) and form undesirable fermentation products (e.g., aldehydes and ketones). The design and monitoring program for a bioremediation remedy should account for these potential secondary effects. Volatile Byproducts. 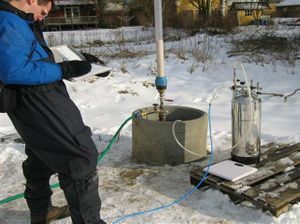 Stimulation of anaerobic biodegradation may enhance generation of gases (e.g., vinyl chloride, methane, or hydrogen sulfide) that may degrade groundwater quality and/or accumulate in the vadose zone. Optimization of the EISB remedy can mitigate and monitor these effects (e.g., use of lower electron donor rates to limit methanogenesis, use of bioaugmentation to prevent vinyl chloride formation, and use of soil gas monitoring). Cost. Amendment material and implementation cost as compared to other viable remediation approaches (e.g., in situ chemical reduction (ISCR), in situ chemical oxidation (ISCO)). Timeframe for Remediation. Development of anaerobic conditions, and the microbial populations capable of complete treatment of target contaminants, may require several months to years. While bioremediation may take longer than other remedial approaches (e.g., ISCO, in situ thermal remediation), this is frequently balanced by lower cost, higher sustainability and reduced likelihood of rebound following remediation. Sustainability. Anaerobic bioremediation frequently uses less electricity and water than many other remedial alternatives, and uses non-toxic amendments, which make it desirable as a sustainable remedial tool. In situ applications avoid transport of materials off-site to disposal facilities. Figure 1. Redox ladder for common electron donors and electron acceptors. Biostimulation means adding compounds to the subsurface to encourage indigenous microorganisms to metabolize target contaminants. In anaerobic reductive processes, simple organic carbon compounds (e.g., sugars, alcohols, aliphatic hydrocarbons, and volatile fatty acids) serve as electron donors to stimulate anaerobic bacterial growth, and thus enhance the rate and extent of biodegradation of the target contaminants. For anaerobic oxidative processes, it may be necessary to add electron acceptors, such as nitrate or sulfate to enhance biodegradation. A crucial component of the design of anaerobic bioremediation systems is selection of appropriate amendments, and their application dosages. In the case of electron donors, the amendments used in bioremediation applications are typically classified as quick release compounds (lactate, sodium benzoate, molasses, whey) or slow release compounds (emulsified vegetable oils, HRC®, EHC®, ABC®+, mulch, compost). 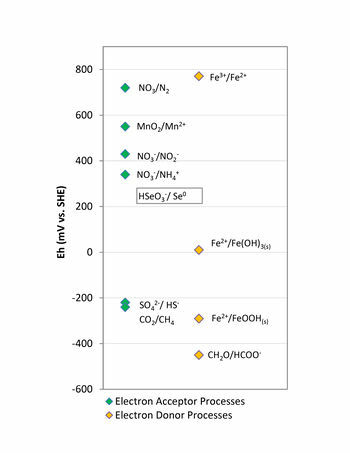 These electron donors are added in anaerobic bioremediation to stimulate conditions conducive to the degradation processes by depleting the dissolved oxygen (DO), and other terminal electron acceptors, and lowering the oxidation-reduction potential of groundwater. In addition, products of electron donor fermentation (i.e., simple organic acids, hydrogen) are required as an energy source for metabolism of decontaminating microbes. The amount of energy released during electron transfer from the donor is controlled by the redox potential (Eh) of the terminal electron acceptor. Therefore, anaerobic microorganisms typically use available native electron acceptors in the following order of preference: nitrate, manganese and ferric iron oxyhydroxides, sulfate, and finally carbon dioxide (Fig. 1). Reductive dechlorination of more highly halogenated organics such as PCE and TCE to dichloroethene (DCE) can occur under mildly reducing nitrate or iron reducing conditions; however, the complete reductive dechlorination of the widest range of the targeted compounds (including degradation of DCE to ethene) often occurs under more strongly reducing conditions of sulfate reduction or methanogenesis. Lightly halogenated organics such as vinyl chloride have also been demonstrated to undergo anaerobic oxidation under iron reducing conditions. Therefore, the optimal anaerobic conditions for complete dechlorination occurs after the competing electron acceptors such as DO, nitrate, and manganese are consumed. Figure 2. Example of bioaugmentation at a field site. Bioaugmentation may be considered at a site when an appropriate population of anaerobic microorganisms is not present or sufficiently active to stimulate complete anaerobic degradation of the existing contaminants. While microorganisms necessary for complete biodegradation of some contaminants (i.e., perchlorate) can be fairly widespread, this is not always the case. In these cases, bioaugmentation is used to enhance bioremediation. Bioaugmentation involves the injection of microbial cultures comprised of non-native organisms known to degrade the targeted contaminants to completion (Fig. 2). For example, the presence of Dehalococcoides-related microorganisms has been linked to complete dechlorination of PCE and TCE to ethene in the field. Commercially available bioaugmentation products that contain these microorganisms include KB-1®, SDC-9™, and Bio-Dechlor Inoculum® Plus. Anaerobic bioremediation is a well-demonstrated remediation strategy for the treatment of a wide range of organic contaminants, most notably chlorinated solvents. The injection of carbon-based electron donors for biostimulation and microbial cultures for bioaugmentation can promote the complete anaerobic biodegradation of contaminants in soil and groundwater. Anaerobic bioremediation has also been used to treat metals and metalloids via immobilization processes. ER-201581 - Post-Remediation Evaluation of EVO Treatment - How Can We Improve Performance? ^ 29.0 29.1 Drever, J.I., The Geochemistry of Natural Waters: Surface and Groundwater Environments. Prentice-Hall, Inc., ISBN 0132727900. ^ Blowes, D.W., Ptacek, C.J., Benner, S.G., McRae, C.W., Bennett, T.A. and Puls, R.W., 2000. Treatment of inorganic contaminants using permeable reactive barriers. Journal of Contaminant Hydrology, 45(1), 123-137. ^ Hashim, M.A., Mukhopadhyay, S., Sahu, J.N. and Sengupta, B., 2011. Remediation technologies for heavy metal contaminated groundwater. Journal of Environmental Management, 92(10), 2355-2388. ^ Air Force Center for Environmental Excellence, Naval Facilities Engineering Service Center, and ESTCP, 2004. Principles and Practices of Enhanced Anaerobic Bioremediation of Chlorinated Solvents. ADA511850. ^ 34.0 34.1 34.2 ITRC, 2008. In Situ Bioremediation of Chlorinated Ethene: DNAPL Source Zones. June, 2008. ^ CL:AIRE, 2010. Results of Laboratory Column Studies to Determine the Potential for Bioremediation of Chlorinated Solvent DNAPL Source Areas. SABRE Bulletin 3. ^ Moretti, L., 2005. In situ bioremediation of DNAPL Source Zones. US Environmental Protection Agency, Office of Solid Waste and Emergency Response, Technology Innovation and Field Services Division. ^ USEPA 2016. Anaerobic Bioremediation (Direct) Application. This page was last edited on 23 October 2018, at 18:04.